Steelhead aka Lake Run Rainbow Trout usually start to show up in fishable numbers in West Michigan rivers by early October, we start our guided trips for steelhead around the 10th. The October steelhead are my favorite, they are in top condition and show so by providing many jumps and long line burning runs. Usually by November the steelhead fishing is going strong in the Grand, Muskegon, and Big Manistee and big number days can be had most days. 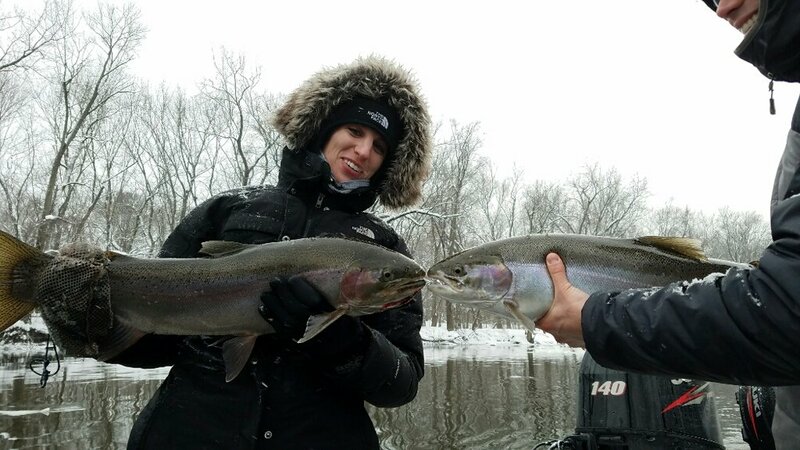 Winter is a great time to get out on a charter and get into Steelhead as well on rivers such as the Grand River, the Muskegon River, and the Big Manistee. There are usually less anglers on the water and the fish will congregate into the deeper slower water making them very predictable. We supply a heater for the boat during the winter months to keep you comfortable in-between fighting fish. Any warm up or melt off in January, February, or March will usually bring in new Spring fish here in Michigan, depending on how many come in, it can be really hot fishing. 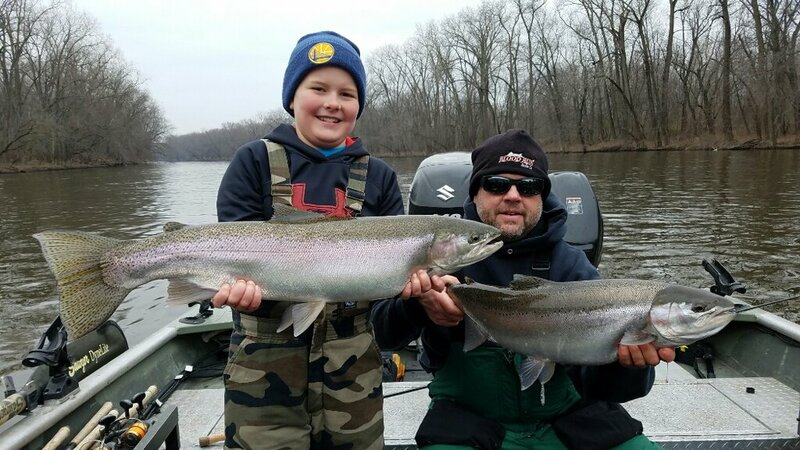 The spring fishing usually gets going good on the Grand River sometime in February and the Muskegon River is a little bit later into March, depending on the weather and river the Spring peak can be in late March or sometime in April. Although we usually float fish for steelhead with Centerpin or spinning rods and reels we also use the methods of dropping back or trolling plugs, back bouncing eggs, and flyfishing. We mainly fish the Grand River, Muskegon River, Pere Marquette River, and the Big Manistee River for Steelhead but also offer drift boat and walk in trips on some of the smaller waters such as the White, Rogue, and other area tributaries.